Last Middle Level Year 'til High School! -a PRE-ALGEBRA course SET by Prentice Hall. 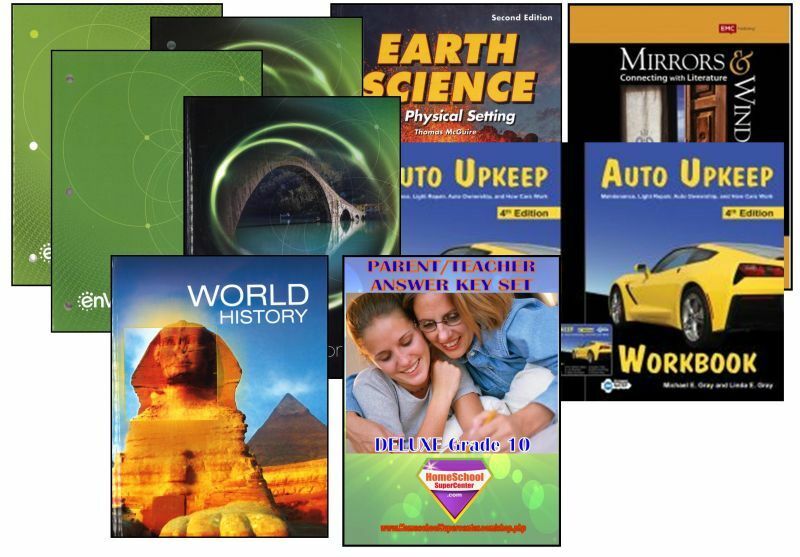 This set consists of a brand new, full-color, hardcover textbook as well as... check this out - an accompanying student workbook AND a Solutions Manual AND a Teacher's Edition on CD-Rom containing Answers, worksheets, and a plethora of... make that... a whole lotta extra stuff! We're setting the standard in middle school mathematics! This math is intended to bridge the gap from elementary mathematics to Algebra 1. Prentice Hall Mathematics helps students at all ability levels attain critical mathematics skills, math concepts and estimation, math vocabulary, problem-solving and interpretation, and communicating mathematical ideas. This course helps to gain significantly higher math computation skills than other math programs. Strategies throughout the textbook provide children with the tools they need to be effective and independent learners. AND...Homework Video Tutors provide guided, step-by-step instruction that support the skills taught in the chapters. -Web access codes are provided throughout the textbook. Real-World Applications are integrated throughout the text and are written in a relevant, engaging style. This is an excellent beginning to Algebra 1 because it integrates all forms of mathematics. It's a very thorough & complete course. The Teacher CD-Rom contains all the course associative materials that can be utilized at home - for the entire level 3 course. We're talking DELUXE! Pre-algebra's not so tough anymore - is it? -A superb PHYSICAL SCIENCE course is going to be utilized for your student's eighth year studies - with experiments and activities galore! This is a hardcover, full-color student text by Holt McDougal - well-known for excellence in education. Internet activities are a staple in this series. 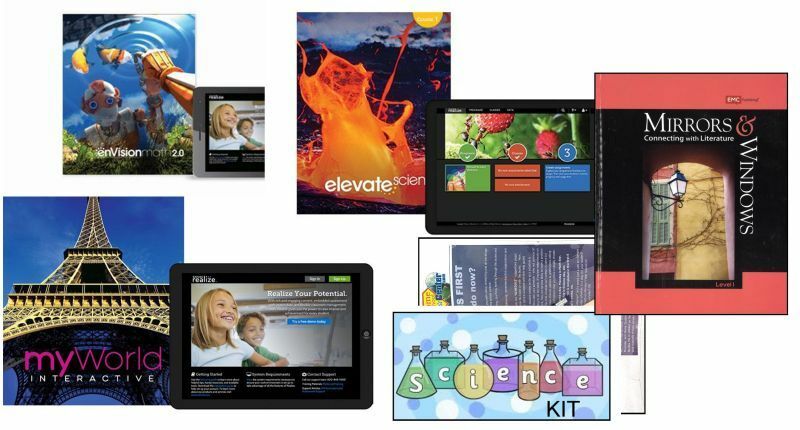 Science activities, accessed on the Internet via the publisher's "Kid-Safe" link program encourages up-to-date research and further learning leading to knowledge retention. And, as usual, we'll give you an Answer Key to the course material! A SCIENCE FUN KIT is included! Your student will be learning while creating. This is a fun-filled educational kit including everything needed explore science - hands on! That's what makes for a DELUXE package. -U.S. HISTORY is the topic this year. This course is very, very nice and consists of a Full-color Hardcover Student Textbook by Pearson Education along with an accompanying Workbook. And, of course, we provide an Answer Key for both the Text and Workbook. To start... your son/daughter will be learning about mankind from the beginning of the continent -- The First Americans. Clovis Point? Yes. whatever that is(a finely flaked spearhead)...they'll learn about it. Continuing from the Olmecs, To the Mayans and Toltecs to Mound builders to the Whig Party to America becoming a World Power to the U.S. Today with it's aging population and Terrorism. It's all here! With over 40 maps, over 35 documents from our History, and over 30 Biographies of Famous U.S. History Makers - your student is receiving a thorough, phenom of a course. This Text includes both the 'Declaration of Independence' and 'Constitution' bound within it's pages. 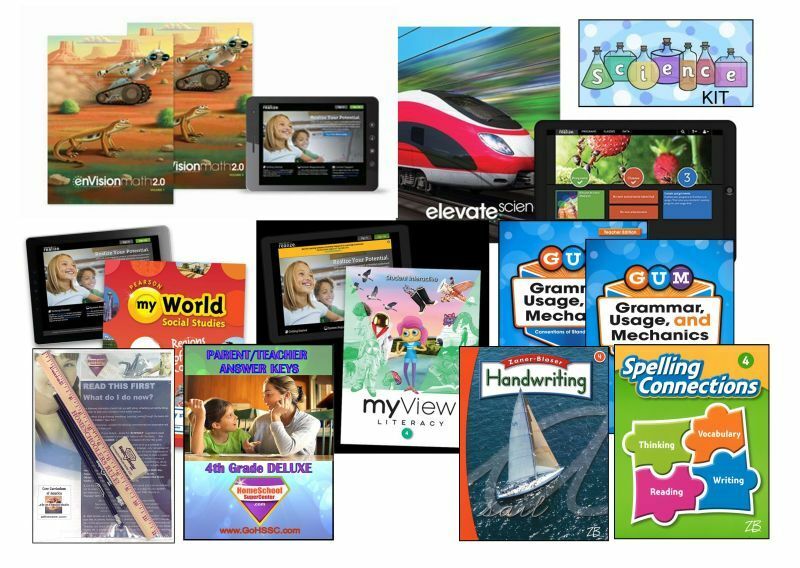 Grammar Practice, Usage and Application, Writing, Fluency, Test Practice, Literary Analysis, Vocabulary & more! 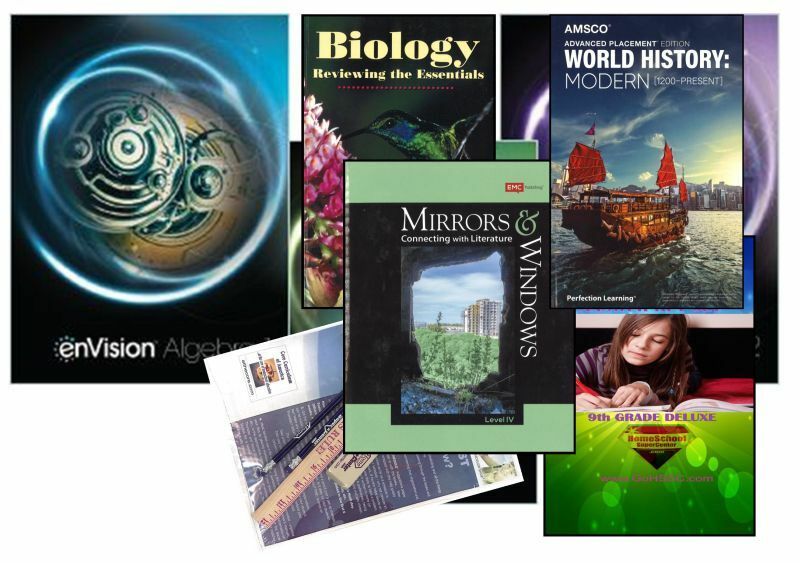 A total CLASSICAL LITERATURE selection will be at your student's beckon call. This awesome textbook contains all a student needs and more! for his/her mastery of 8th grade. This gorgeous Textbook presents classic and contemporary literature selections from authors representing a variety of cultural and ethnic viewpoints. An excellent Classical Literature course! From stories & novels to drama & poetry - all found within this excellent textbook. You'll be impressed! It's all here - Edgar Allan Poe, Tolstoy, Anne Frank, Sir Arthur Conan Doyle, Langston Hughes, Stephen King, Ray Bradbury, T.S. Eliot, and many more famous authors! The best products for the best students. -OH YES! Our Standard & Deluxe Packages always consist of: A FREE gift for the student, A Full-Year schedule of all Core Courses, Record Keeping Forms, Report Card Form, Transcript Form, and a Teaching & Scheduling Guide,& a Certificate of Completion, suitable for framing. you're on homeschool 'easy street'. 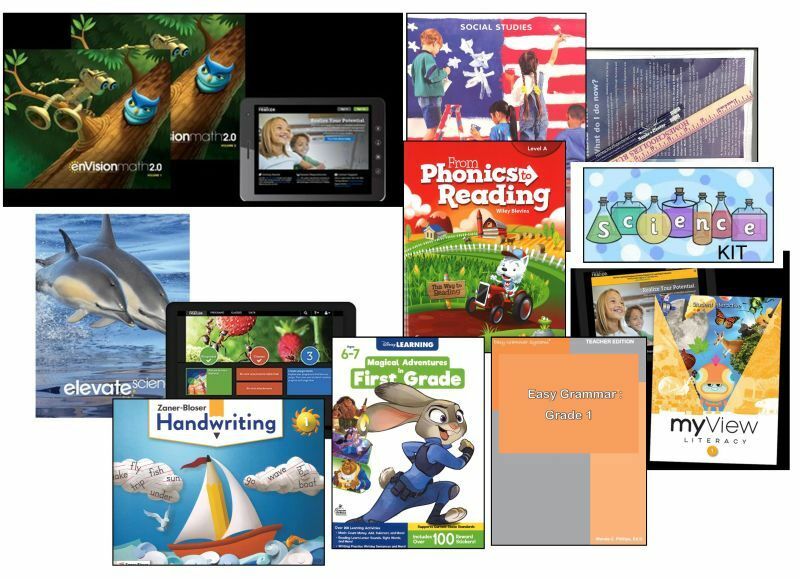 Some bundles may contain curricula modified specifically for homeschool families. 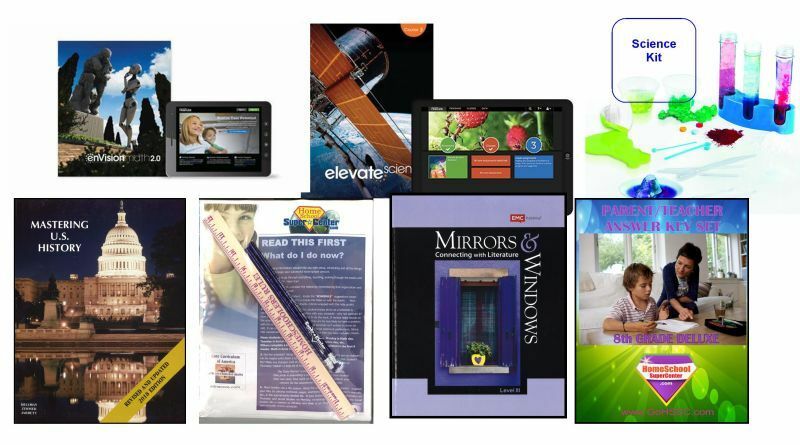 At times, there may be references to print or digital components that are not included within the homeschool bundle - fact is - there is so much content there's no need for the digital component.